Tuesday [6 January 2015] was the Feast of the Epiphany. The Greek word ἐπιφάνεια (epipháneia) means “manifestation,” or “striking appearance.” It is an experience of sudden and striking realisation, and in classical drama and literature it often describes the visit of a god to earth. The feast of Christ’s divinity at Epiphany completes the feast of his humanity at Christmas, so we could say while Christmas is the family feast of Christianity, Epiphany is the great world feast of the Church. ● The Wedding at Cana (John 2: 1-11, a second service on 6 January, and the weekday A readings for 7 January, although not for any of the Sundays). In each of these three events, Christ is manifest as God-incarnate at a point that marks the beginning of his ministry or his presence in the world. It is the moment when we are caught off guard as we realise that this seemingly helpless new-born child, or this one among many in the team of visitors to John the Baptist at the Jordan, or this anonymous guest among many at a provincial wedding, is in fact the omnipotent God, the King and Ruler of the universe. Our celebrations of Epiphany mark the extension of Christ’s kingship to the whole world, not merely for a chosen few, but for all. During Advent, the world is in darkness, at Christmas the Light shines forth, and at Epiphany the Light bursts forth to all nations and the prophecy is fulfilled: “Nations shall come to your light, and kings to the brightness of your dawn” (Isaiah 60: 3). ● The three kings return to their own country, albeit by another road, yet carrying to all they return to (see Matthew 2: 12). ● After his Baptism, Christ goes into wilderness (see Matthew 4: 1) and then withdraws to Galilee to begin his ministry (see Matthew 4: 12; Mark 1: 14; Luke 3: 23; John 1: 43). ● After the wedding at Cana, Jesus goes back to Capernaum with his mother, his brothers, and his disciples (see John 2: 12). The story of the Wedding at Cana is not one of the Sunday lectionary readings this year, but it takes up the third of the great themes of Epiphany, the wedding feast or royal banquet. The wedding at Cana suggests Christ’s wedding with the Church. 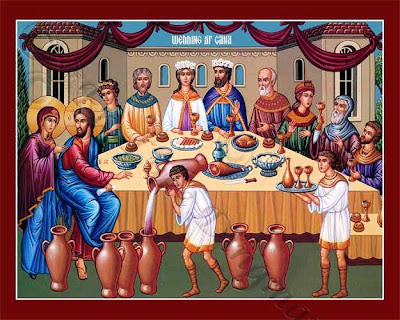 The wedding banquet at Cana not only prefigures the banquets in the Gospel parables and the heavenly banquet – it also prefigures the banquet at the Last Supper, when more than wine is poured out. 1 Καὶ τῇ ἡμέρᾳ τῇ τρίτῃ γάμος ἐγένετο ἐν Κανὰ τῆς Γαλιλαίας, καὶ ἦν ἡ μήτηρ τοῦ Ἰησοῦ ἐκεῖ: 2 ἐκλήθη δὲ καὶ ὁ Ἰησοῦς καὶ οἱ μαθηταὶ αὐτοῦ εἰς τὸν γάμον. 3 καὶ ὑστερήσαντος οἴνου λέγει ἡ μήτηρ τοῦ Ἰησοῦ πρὸς αὐτόν, Οἶνον οὐκ ἔχουσιν. 4 [καὶ] λέγει αὐτῇ ὁ Ἰησοῦς, Τί ἐμοὶ καὶ σοί, γύναι; οὔπω ἥκει ἡ ὥρα μου. 5 λέγει ἡ μήτηρ αὐτοῦ τοῖς διακόνοις, Ο τι ἂν λέγῃ ὑμῖν ποιήσατε. 6 ἦσαν δὲ ἐκεῖ λίθιναι ὑδρίαι ἓξ κατὰ τὸν καθαρισμὸν τῶν Ἰουδαίων κείμεναι, χωροῦσαι ἀνὰ μετρητὰς δύο ἢ τρεῖς. 7 λέγει αὐτοῖς ὁ Ἰησοῦς, Γεμίσατε τὰς ὑδρίας ὕδατος. καὶ ἐγέμισαν αὐτὰς ἕως ἄνω. 8 καὶ λέγει αὐτοῖς, Ἀντλήσατε νῦν καὶ φέρετε τῷ ἀρχιτρικλίνῳ: οἱ δὲ ἤνεγκαν. 9 ὡς δὲ ἐγεύσατο ὁ ἀρχιτρίκλινος τὸ ὕδωρ οἶνον γεγενημένον, καὶ οὐκ ᾔδει πόθεν ἐστίν, οἱ δὲ διάκονοι ᾔδεισαν οἱ ἠντληκότες τὸ ὕδωρ, φωνεῖ τὸν νυμφίον ὁ ἀρχιτρίκλινος 10 καὶ λέγει αὐτῷ, Πᾶς ἄνθρωπος πρῶτον τὸν καλὸν οἶνον τίθησιν, καὶ ὅταν μεθυσθῶσιν τὸν ἐλάσσω: σὺ τετήρηκας τὸν καλὸν οἶνον ἕως ἄρτι. 11 Ταύτην ἐποίησεν ἀρχὴν τῶν σημείων ὁ Ἰησοῦς ἐν Κανὰ τῆς Γαλιλαίας καὶ ἐφανέρωσεν τὴν δόξαν αὐτοῦ, καὶ ἐπίστευσαν εἰς αὐτὸν οἱ μαθηταὶ αὐτοῦ. 1 On the third day there was a wedding in Cana of Galilee, and the mother of Jesus was there. 2 Jesus and his disciples had also been invited to the wedding. 3 When the wine gave out, the mother of Jesus said to him, ‘They have no wine.’ 4 And Jesus said to her, ‘Woman, what concern is that to you and to me? My hour has not yet come.’ 5 His mother said to the servants, ‘Do whatever he tells you.’ 6 Now standing there were six stone water-jars for the Jewish rites of purification, each holding twenty or thirty gallons. 7 Jesus said to them, ‘Fill the jars with water.’ And they filled them up to the brim. 8 He said to them, ‘Now draw some out, and take it to the chief steward.’ So they took it. 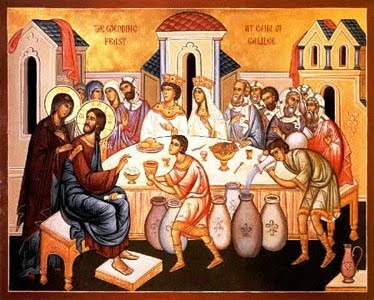 9 When the steward tasted the water that had become wine, and did not know where it came from (though the servants who had drawn the water knew), the steward called the bridegroom 10 and said to him, ‘Everyone serves the good wine first, and then the inferior wine after the guests have become drunk. But you have kept the good wine until now.’ 11 Jesus did this, the first of his signs, in Cana of Galilee, and revealed his glory; and his disciples believed in him. Chapter 1 of Saint John’s Gospel introduces us to a new creation, a new creation that is in Christ. After the Prologue, there are six days in this new creation, and we now come to Day Seven. What did God do on the Seventh Day in the account of creation in the Book Genesis? God rested. And now that we have are at Day Seven in the opening week of Saint John’s Gospel, we come to the Day that Christ rests with his disciples, and to a foretaste of the Heavenly Banquet, which is the completion of God’s creation. “Blessed are those who are invited to the marriage supper of the Lamb” (Revelation 19: 9). Seven has a symbolic meaning or significance in this Gospel. This is the first of the seven miraculous signs by which Saint John attests to Christ’s divine status. This Gospel is structured around these signs, and the word used by John is unique. He uses the Greek word σημεῖον (semeion, “sign” or ἔργον, ergon meaning “work”), instead of the term the Synoptic writers normally use for miracle, δύναμις (dynamis, meaning act of power). 7. The raising of Lazarus (11: 17-45). These are completed then by the Greatest Sign, the Resurrection (see 2: 18-22). 7. I AM the True Vine (15: 1). 7. John the Beloved Disciple (20: 31). And so the first of the seven signs comes on the seventh of the seven days that introduce the Gospel. This miracle is not mentioned in any of the other three Gospels, although it has parallels with the parable of the New Wine and Old Wineskins (see Matthew 9: 14-17; Mark 2: 21-22; Luke 5: 33-39). In the Old Testament, we read promises of an abundance of wine in the time of the Messiah (Genesis 27: 27-28; 49: 10-12; Amos 9: 13-14), especially at the wedding feasts (see Isaiah 62: 4-5). The wine in this story represents the overflowing and abundant blessings of God coming to fruition. But what does this sign mean for you? Do you find it an embarrassing miracle story that is difficult to provide with meaning to drunks who think, in the way that only drunks can think, that they are being humorous or, even worse, perfectly logical and rational? 1, This story illustrates how someone transformed from a worldly way of life to a heavenly way of life, to receive the gift of earthly life. 2, The jars of water for cleaning the utensils are empty, but the meal has not yet finished. Who is going to do the washing up and how is it going to be done? Could the old water in the five jars represent the teaching in Torah that has served its purpose but has run out, so that it is replaced by the teaching of Christ, who is the living water? 3, Who is given a new start at the wedding? Those who receive and drink this new wine receive what Jesus gives, and do what he wants them to do. Can there be any new life in Christ without Discipleship? 4, Who is saved from embarrassment, has benefitted from face-saving in this story? The host at the wedding? The chief steward? The servants? The Virgin Mary? The couple getting married? In this story, Jesus the guest becomes Jesus the host – what is the sacramental parallel of this? 5, Who are the members of the family at this wedding in Cana? 6, Is Church, whether it is here in this community as we worship or in our normal Sunday experience, an experience of family? An experience of God’s generosity? And is it an experience of the presence of Christ in word, in sacrament, in community? 7, Do you find rest and sabbatical on average every seven days. As all of us are active on Sundays in congregations on Sundays, when do you find “sabbath time” to rest and be with God and family every seven days? I have long wondered why the lectionary provisions for this Gospel reading (John 2: 1-11) end at verse 11, and do not include verse 12. 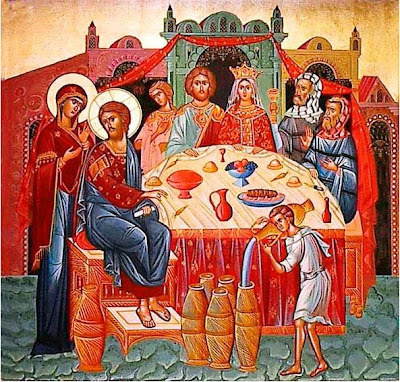 The gifts that Christ brings to the wedding at Cana are overshadowed by the generous outpouring of wine that allows the wedding to continue, just as the story of his Baptism by John in the Jordan is overshadowed by the Holy Spirit who hovers over the waters as a reminder of a new creation. But the other miracle at Cana is the formation of new families. Someone becomes a new father-in-law, a new sister-in-law, eventually a new grandmother, a new uncle. The fruit of the vine becomes the wine; the fruit of the wedding is a new family. The new family in the banquet with Christ though is that family that comes to live with him in verse 12 – not just his mother and brothers, but his disciples too. We become a new and renewed family around the table at the banquet, and it is imperative for us to reflect this in our celebrations of the Eucharist here and elsewhere. Canon Patrick Comerford is lecturer in Anglicanism and Liturgy, the Church of Ireland Theological Institute. This reflection was prepared for a faculty meeting on 8 January 2015.